Traditional TCP implementations have an under-utilization problem in high bandwidth delay product networks. 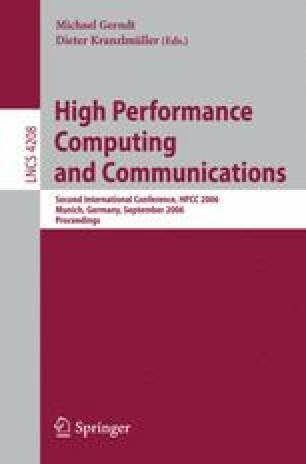 This paper proposes a new congestion control mechanism, a high performance TCP (HP-TCP), to solve the under-utilization problem. The congestion avoidance period of the HP-TCP control is divided into linear and exponential growth phases, where the linear increase phase is similar to that of the legacy TCP; when there is no queueing delay in the linear increase phase, the congestion window grows exponentially to fill a large pipe quickly. The exponential increase phase can cause serious problems of overshooting the network capacity, which results in massive retransmissions and low bandwidth utilization. To solve this problem, the proposed algorithm uses the RTT status and the estimated bandwidth to prevent packet losses during the exponential growth phase. The simulation results show that the HP-TCP improves the convergence time and throughput performance of the TCP in high bandwidth delay product networks.